A few decades ago, you needed to have sophisticated software and special IT skills to convert a document to PDF. The software was also highly priced to the extent only the high-end companies and users could afford them. Luckily, advancement in technology has led to the development of new PDF converter software that is more reliable and efficient. Advanced Scan to PDF For Free is revolutionary software that we have tested and found to be very effective in converting documents into PDF format. The thousands of positive reviews that it has garnered over the years is enough proof that it delivers on its promise of excellence and reliability. As you can tell from the name, this software is 100% free to use and there is absolutely no limit on the number of documents that you can convert using it per day. Let’s proceed and look at some of the primary features that place it miles ahead of other similar software in the market. If you have ever tried to use the conventional scan to PDF software, you know how time-consuming and tedious it is to run multiple documents. This is because you will be forced to scan and convert each document at a go. 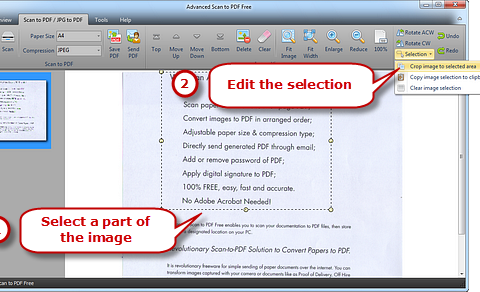 Advanced Scan to PDF For Free is hoisted to change this by allowing users you scan multiple paper documents at the same. Once you load the documents, it will go ahead and convert each of them into a PDF document. All these processes happen in just a couple of seconds, and so you do not have to change your schedule or forego your other important daily tasks just to convert the documents into one PDF. Remember those photos that you treasure and would not want to lose; now you can document them all by using Advanced Scan to PDF For Free. This software has the capacity to convert JPEG files into one PDF document for easier sharing or archiving purposes. It can handle hundreds of them at a go so you do not have to spend hours working on it. In addition, companies and business executives can download and use this software to convert paper contracts, agreements and other official documents that are in formats such as BMP, PNG, JPG, and GIF into PDF files. Doing so will greatly help to streamline operations in the business and ensure that no document is lost. We have in the past used the software to convert safety sign-offs, driver time sheets, off-hire notes and even proof of delivery documents into PDF for archiving and easily sharing purposes. You no longer have a reason to keep a heap of essential documents in hard copy. 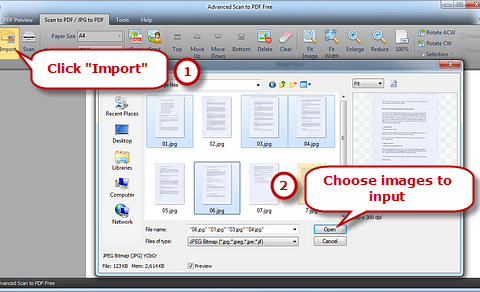 This is one of the features that make Advanced Scan to PDF For Free different from the other software. When scanning documents, you might need to change their sizes before converting them into PDF format. This software can help you do that without breaking a sweat. You can flip and rotate images in both clockwise and anti-clockwise as well as change the orientation to suit your preferences. In addition, you can crop the images before they are converted. To make the deal even sweeter, you can reverse any change that you make to the images if you realize that you have made a mistake by just clicking on Redo or Undo buttons. The ability to preview a document will come in handy especially when handling delicate images and documents such as contracts and agreements. Advanced Scan to PDF For Free has an inbuilt preview window that you can use to preview any file before they are converted into PDF format. More importantly, you can add meta data such as subject, author, title and much more to make the document more relevant to the purpose. When loading images to the software, you can use Fit Image/Width as well as Enlarge/Reduce feature to organize the images in your desired order. You definitely have some confidential documents whose details you would not want to be revealed to any authorized personnel. Advanced Scan to PDF For Free got your back as you can quickly and efficiently encrypt and decrypt any PDF document. All you need to do is input your desired password and only share it with people whom you trust or are allowed to view the documents. It is also important to note that you can remove as well as change the password at will. We live in a digital world where all communication is done digitally. Once you download Advanced Scan to PDF For Free you will not need to use any other un-digital channels to share the documents. The converted documents can be sent to colleagues via Outlook as attachments. This feature will definitely help to increase the productivity of your colleagues or employees as the entire scanning, conversion, and sending process only takes a few seconds. With advancement in digital technology, we are faced with a new breed of threats. Advanced Scan to PDF For Free will protect you from such threats by allowing you to incorporate a digital signature in the PDF documents. This will ensure that your employees are always using the right documents as they will be able to authenticate the original source of the information and that the content was not changed after the digital signature was applied. Advanced Scan to PDF For Free is a reliable tool that you can use to convert documents not only at the office but also in your house. The security features, the digital signature and ability to protect the PDF files with a password, will ensure that your privacy and confidentiality is not compromised especially when sharing the documents via email with friends and colleagues.